An invasive species of marsh grass that spreads, kudzu-like, throughout North American wetlands, may provide similar benefits to protected wetlands as native marsh grasses. According to new research from North Carolina State University, the invasive marsh grass’s effects on carbon storage, erosion prevention and plant diversity in protected wetlands are neutral. The findings could impact management strategies aimed at eradicating the invasive grass. Phragmites australis, known as the common reed, is an invasive marsh grass that can spread at rates up to 15 feet per year. It thrives throughout North American wetlands, and studies have demonstrated that its densely packed growth pattern chokes out native marsh plants, thereby reducing plant diversity and habitat used by some threatened and endangered birds. However, other studies have shown that Phragmites may help reduce shoreline erosion in marshlands and store carbon at faster rates than native grasses. 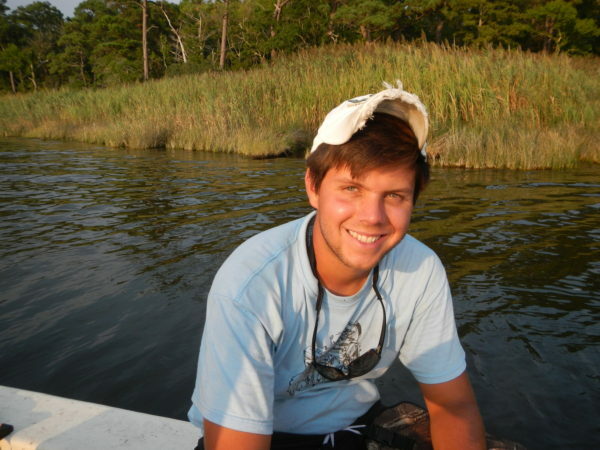 Since managing the threat is costly – in 2013, efforts to eradicate Phragmites cost about $4.5 million – Seth Theuerkauf, a Ph.D. candidate in marine, earth and atmospheric sciences at NC State, decided to look at how relative abundance of the marsh grass affected the ecosystem services that humans value from marshes, such as their ability to stabilize shorelines. Theuerkauf and his colleagues looked at impacts of Phragmites on marshes in two protected reserves within the northeastern portion of the North Carolina Coastal Reserve system. In particular, they wanted to compare ecosystem services – plant diversity, shoreline stabilization and carbon storage – between marshes with varying amounts of Phragmites: those with only native grasses, those with a mix of grasses and those with only Phragmites. The findings were encouraging. 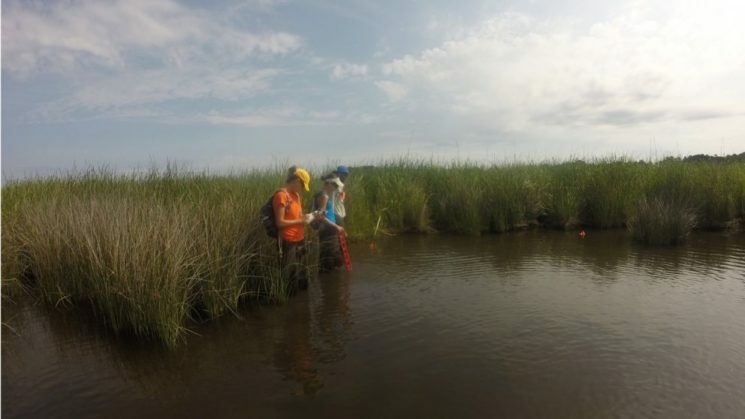 The team found no significant differences between ecosystem services of the marshes they studied, indicating that Phragmites’ effect was largely neutral. However, Theuerkauf points out that the neutral effect could be due to the protected status of the wetlands they studied and the specific ecosystem services evaluated. “Studies that associate Phragmites with negative impacts on wetlands are often conducted in areas that have seen significant human interventions, such as shoreline development or construction of drainage canals, whereas our study was conducted in undisturbed marsh habitat within a protected reserve system,” Theuerkauf says. The research appears online in PLOS ONE. The work was funded in part by North Carolina Sea Grant and the North Carolina Coastal Reserve. Brandon Puckett, research coordinator for the North Carolina Coastal Reserve; NC State graduate student Kathrynlynn Theuerkauf; Ethan Theuerkauf, formerly of UNC-Chapel Hill’s Institute of Marine Science and currently at Illinois State Geological Survey; and Dave Eggleston, professor of marine, earth and atmospheric sciences at NC State contributed to the work. Invasive species can positively, neutrally, or negatively affect the provision of ecosystem services. The direction and magnitude of this effect can be a function of the invaders’ density and the service(s) of interest. We assessed the density-dependent effect of an invasive marsh grass, Phragmites australis, on three ecosystem services (plant diversity and community structure, shoreline stabilization, and carbon storage) in two oligohaline marshes within the North Carolina Coastal Reserve and National Estuarine Research Reserve System (NCNERR), USA. Plant species richness was equivalent among low, medium and high Phragmites density plots, and overall plant community composition did not vary significantly by Phragmites density. Shoreline change was most negative (landward retreat) where Phragmites density was highest (- 0.40 ± 0.19 m yr-1 vs. -0.31 ± 0.10 for low density Phragmites) in the high energy marsh of Kitty Hawk Woods Reserve and most positive (soundward advance) where Phragmites density was highest (0.19 ± 0.05 m yr-1 vs. 0.12 ± 0.07 for low density Phragmites) in the lower energy marsh of Currituck Banks Reserve, although there was no significant effect of Phragmites density on shoreline change. In Currituck Banks, mean soil carbon content was approximately equivalent in cores extracted from low and high Phragmites density plots (23.23 ± 2.0 kg C m-3 vs. 22.81 ± 3.8). In Kitty Hawk Woods, mean soil carbon content was greater in low Phragmites density plots (36.63 ± 10.22 kg C m-3 ) than those with medium (13.99 ± 1.23 kg C m-3) or high density (21.61 ± 4.53 kg C m-3), but differences were not significant. These findings suggest an overall neutral density-dependent effect of Phragmites on three ecosystem services within two oligohaline marshes in different environmental settings within a protected reserve system. Moreover, the conceptual framework of this study can broadly inform an ecosystem services-based approach to invasive species management.